Derived from soy protein hydrolysate. Use in commercial production to provide nitrogen to help plants grow quickly, increase seed and fruit production, and improve plant quality and appearance. Derived from : Soy protein hydrolysate. Grower's Secret Nitrogen 16-0-0, 50 lbs. Grower's Secret Nitrogen 16-0-0, 44 x 50 lbs. Grower's Secret Nitrogen 16-0-0, 1225 lbs. How is Grower's Secret Nitrogen applied? Grower's Secret Nitrogen is a dry, very hygroscopic powder which cannot be used dry or blended with dry fertilizers for direct application. 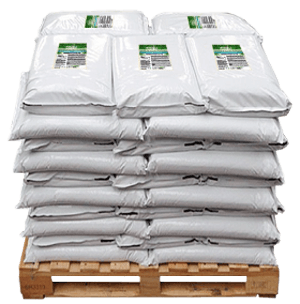 It is compatible with other fertilizers and can be used as a liquid pre plant or in season side-dress application. To optimize uptake and utilization by the crop GSI recommends dissolving the GSN in water and applying it as a foliar spray. GSN may also be applied via drip or sprinkler irrigation. Will Grower’s Secret Nitrogen damage or burn my crops? Grower's Secret 13-0-0 and 12-0-0 provides the majority of nitrogen in the form of amino acids. Amino acids are readily taken into the plant under warm and cool conditions and used for protein and chlorophyll synthesis. There is no salt buildup and hence there is little change of fertilizer burn. GSI recommends you add GS Professional to your GSN applications to maximize amino acid uptake. Why waste this valuable form of nitrogen? What is the shelf life of Grower's Secret Nitrogen? GSN is very hygroscopic and will absorb moisture from the air when packaging integrity is breached. A sealed bag will last approximately 2 years form the date of purchase. If moisture does enter the bag, the product will cake but will still be 100% usable. It will however take longer mixing to dissolve the caked material. What packaging sizes is Grower’s Secret Nitrogen sold in? Grower's Secret Nitrogen is available in 50 lb. bags, and in 1,125 lb. super sacks. Can Grower's Secret Nitrogen be used through a drip system? What is the proper application rate for Grower's Secret Nitrogen? Naturally the amount of product to apply depends on the crop, it's stage of growth, plant health and yield potential. Always conduct crop and soil analysis to determine plant needs. In general, two to 10 pounds per acre, one to two times per month and at selected growth stages with influence yield and quality. GSI suggests starting with 2-5 pounds per acre with your initial applications and adjust the amounts as needed based on growing conditions, requirements, leaf N, and overall plant health. GSN is a perfect fertilizer to use when spoon feeding frequent low amounts of N to manage your crop. Grower's Secret Nitrogen delivers amino acids for healthier, more robust plants.